Here’s the first of the promised galleries. 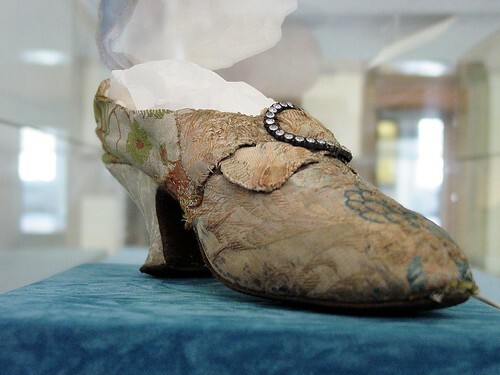 The Museum of Edinburgh is at 143 Cannongate across the road from the Old Tollbooth. 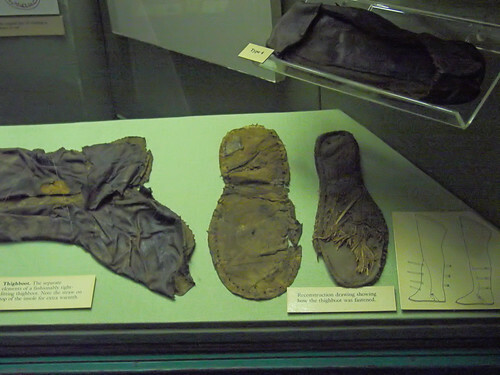 The leather galleries are closed for renovation at the moment, so I’ve added the shoe and pattern pictures from an earlier trip. 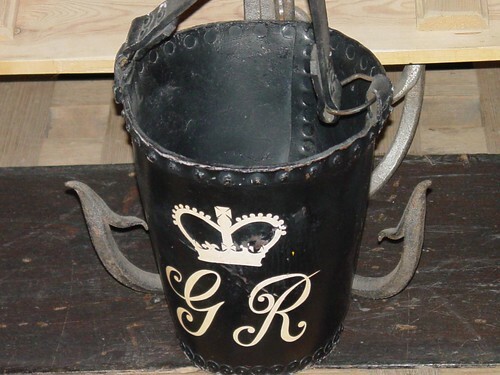 Leather fire bucket, possibly from Holyrood House, with the crowned cypher of George IV painted on the side, dating it (the paint if not the bucket) to between 1820 and 1830. 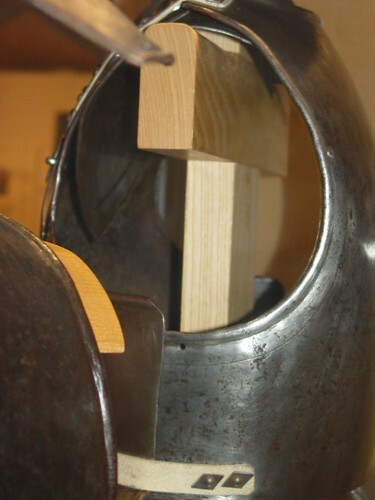 Construction is much simpler than the early Tudor and Dutch buckets I’ve showcased previously, but not riveted. 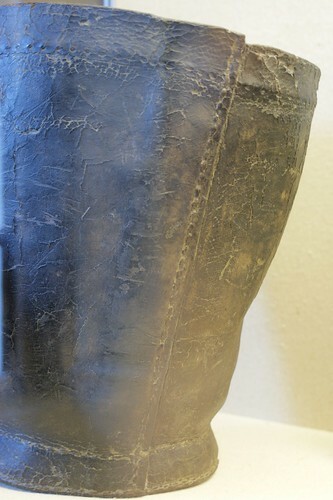 This angle shows the inside of the back seam, and that a reinforcing piece appears to have been riveted on, with the top band then sewn over it. 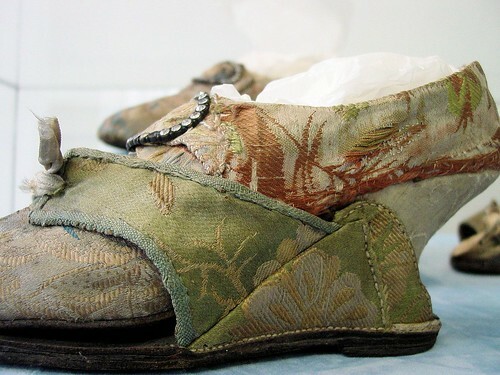 Silk brocade covered leather shoe, mid-17th century, showing the method of attaching the fabric. 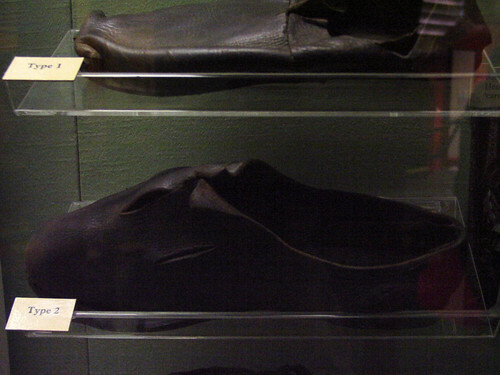 The other shoe of the pair showing a fabric and leather pattern. 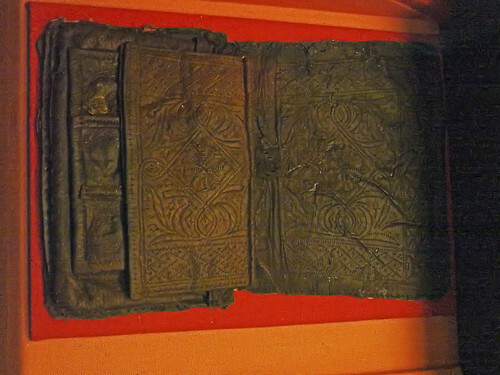 Fabric and leather pattern, mid 17th century. 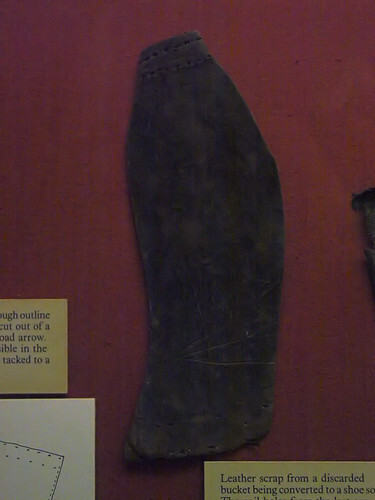 Many of you will know of the UK Portable Antiquities Scheme and its excellent on-line database. 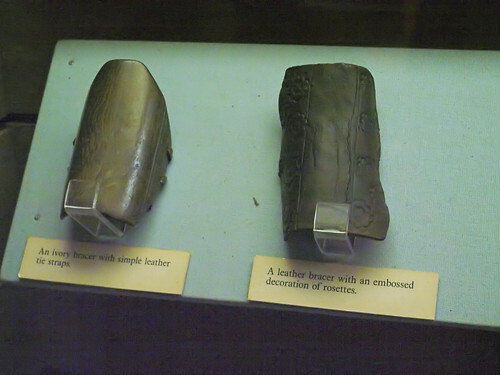 I’m an occasional visitor and usually run a simple search on the Primary Material: Leather to see what has been added since my last visit. I did it again last week and this one came up. 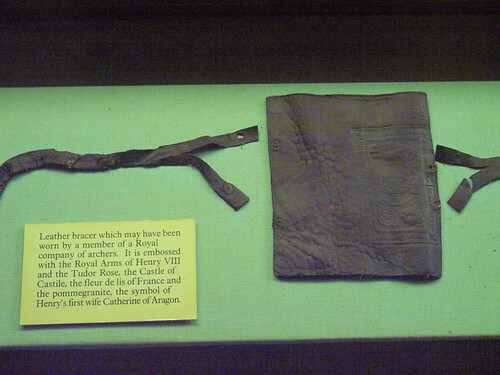 Identified as a strap from a piece of armour such as a breast plate which would have been worn in the civil war era. 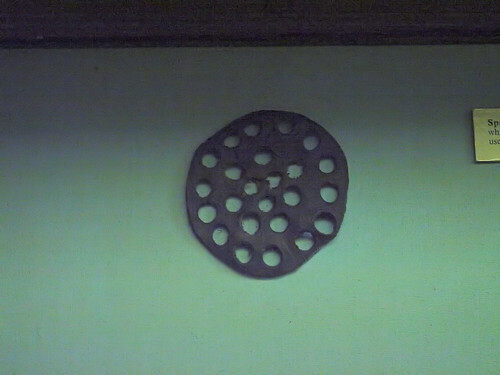 I’ve linked the picture to the full record for the item. Those of you who know me will be starting to wonder what I’ve done… I’m afraid I’m a repeat offender. An example is here, but there are plenty of others. 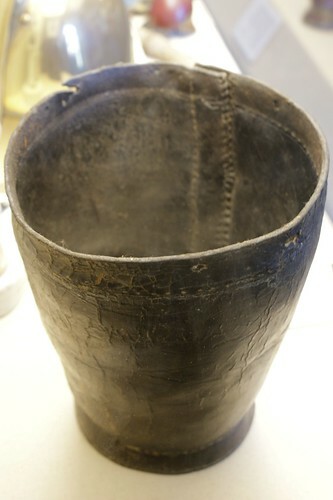 I disagree with the identification of the item, and think it is from a late 18th or early 19th century leather bucket. I’ve summarised my case in the comment on the database record but would like to provide some information and examples here that I can’t on that site. Have a good look at the database record, possibly keep it open in another window. 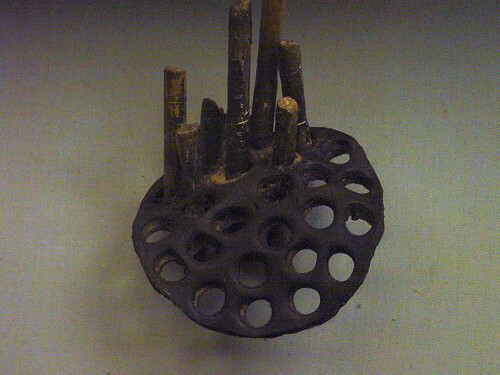 Note the curve in the object, the closeness and type of rivets and washers and even the number of layers. The dimensions are relevant, particularly the thickness. I’ll repeat them here. Let’s check the confidence with which the identification was made. 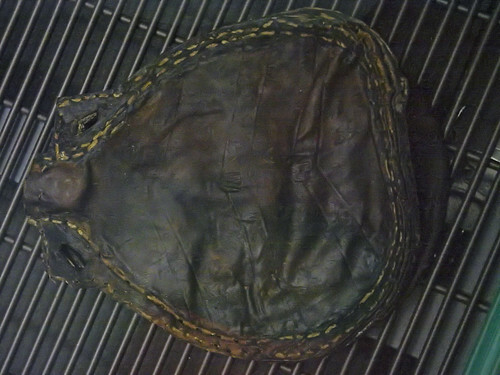 Natasha Ferguson from the Centre for Battlefield Archaeology in Glasgow has seen a photograph of this item and says it is probably a ‘strap from a piece of armour such as a breast plate which would have been worn in the civil war era’. 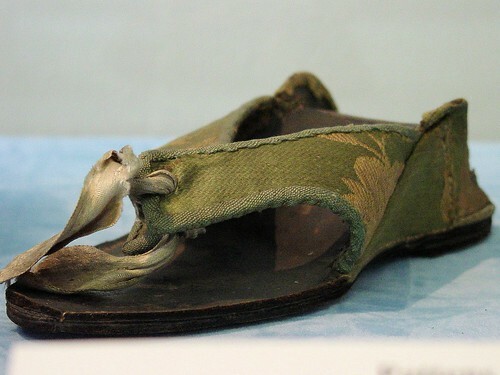 It is also identified as a “battlefield find”. 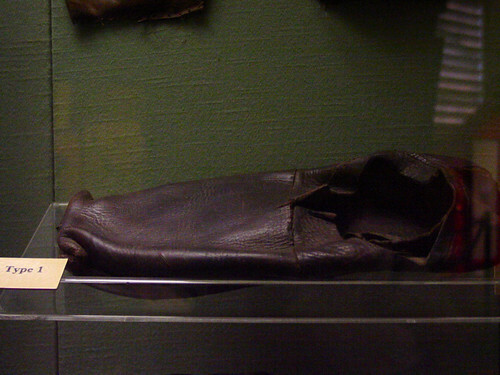 Note that the identification is from a photograph and is only “probably”. 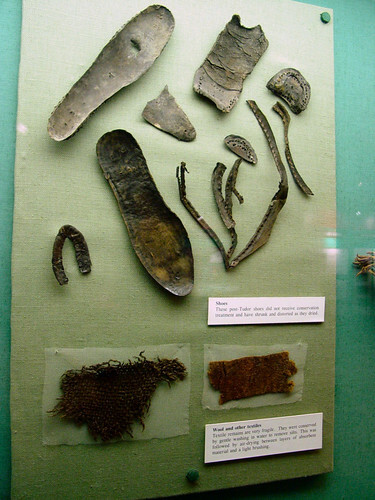 Putting those together, I’m recognising a pattern of “it is from a battlefield so it must be from armour” much in the same way that any left shoe found is a “ritual object“. 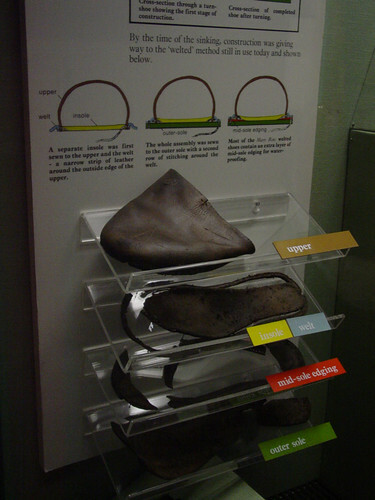 So let’s have a look at some of the leather straps on the types of armour in the period in question. 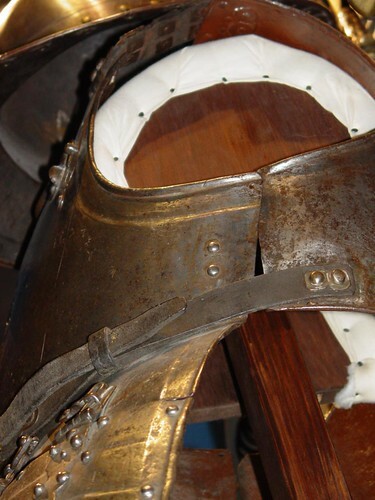 It is a little complex as armour was made in a number of factories in Blighty and lots was left over from previous wars and also imported from Europe in some quantity. 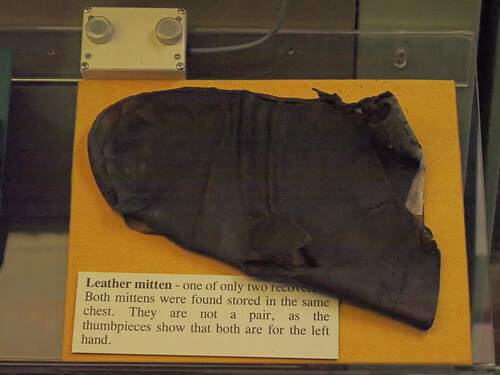 One of the constants is that the leather straps are only one layer of leather thick. 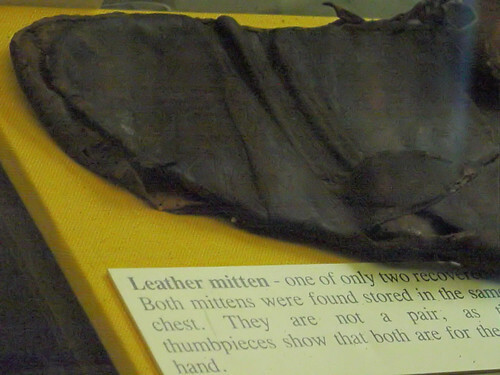 The first example is from the York Castle Museum. 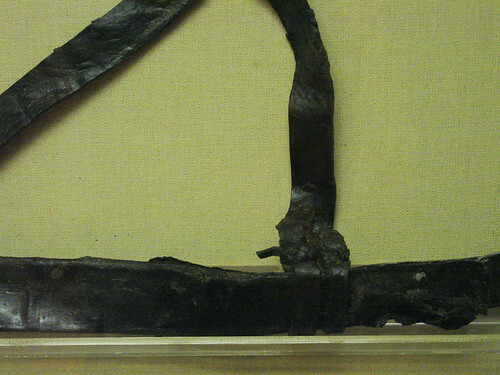 Low view from level with the pikeman's left knee would have been, showing the waist belt and the inside of the shoulder straps. 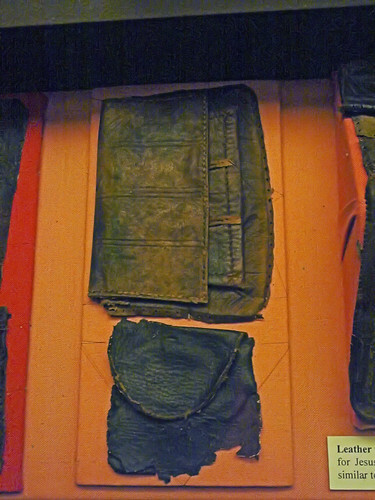 Some of the rivets and washers can be seen. 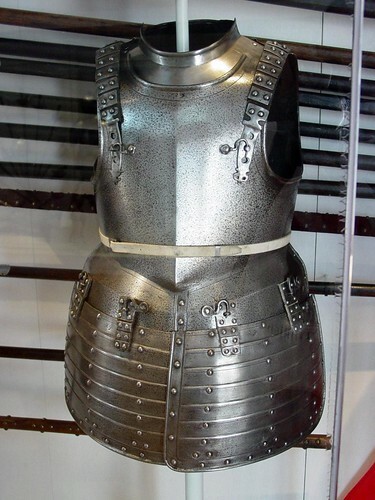 Nowhere does this armour have flat headed rivets or round washers. This one is of English manufacture. Here’s another one of European origin. 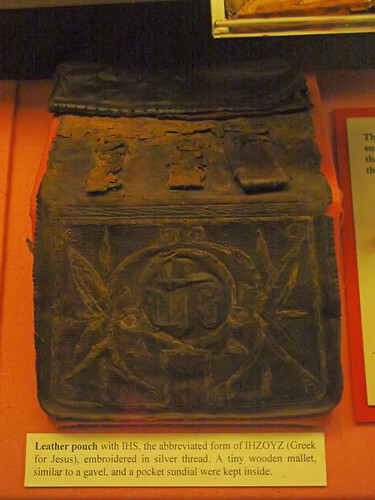 This one is in the Leeds Armouries. Again, the straps aren’t 10mm thick, the rivets all have domed heads and if you look at the inside, the washers are square. 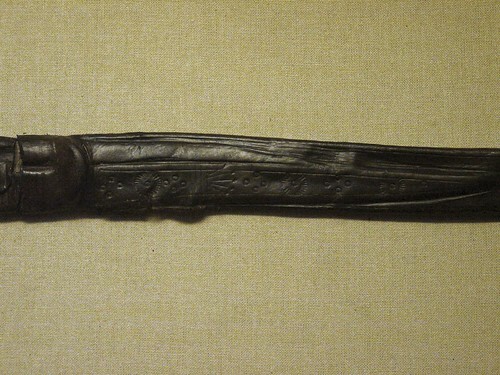 The last one is a side view of one in the Dover Museum that was on loan from Leeds. 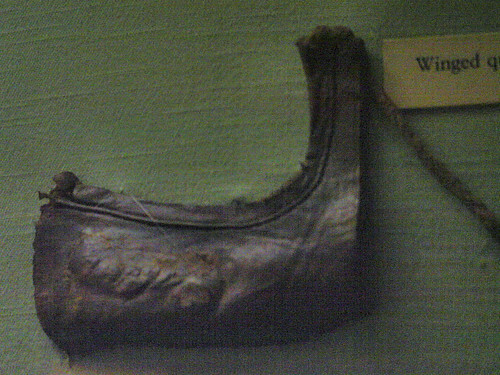 Side view, English Pike Armour, Dover Museum. The other forms such as the heavy cuirassier armour follow the same pattern, I won’t bore you further with more armour photos but I do have photos of at least 50 contemporary armours and all follow the same pattern. 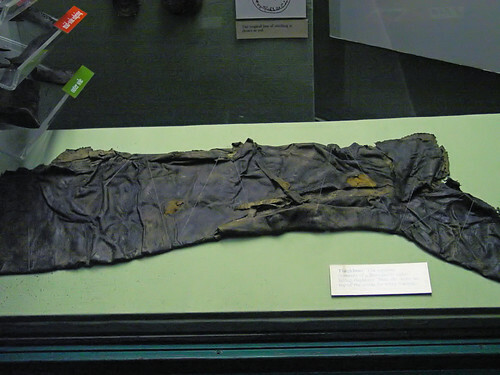 Having demonstrated (to my satisfaction anyway) that it isn’t an armour strap, I suppose I should now provide some evidence that it is what I think it is. 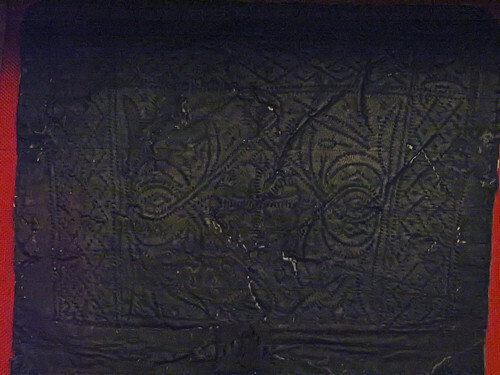 Have a look at the next couple of photos and make up your own mind. 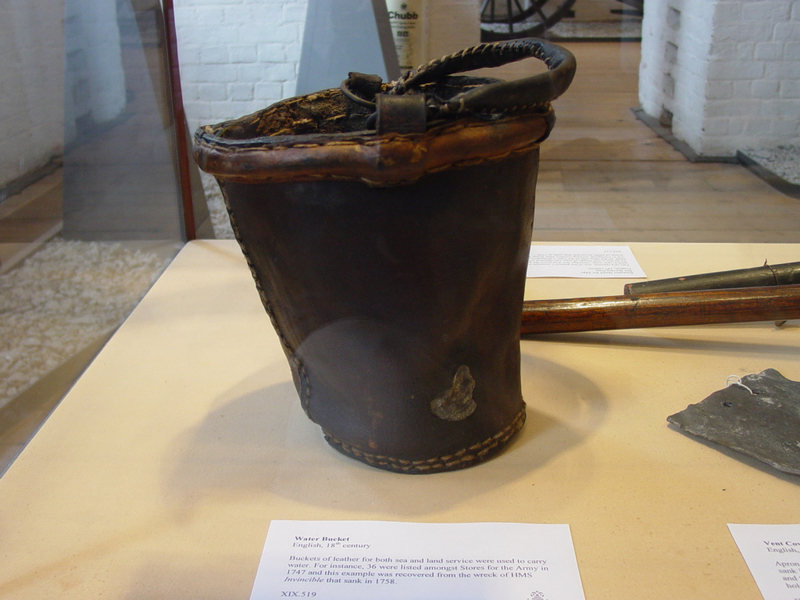 A modern copy of a water bucket carried on the Victory. 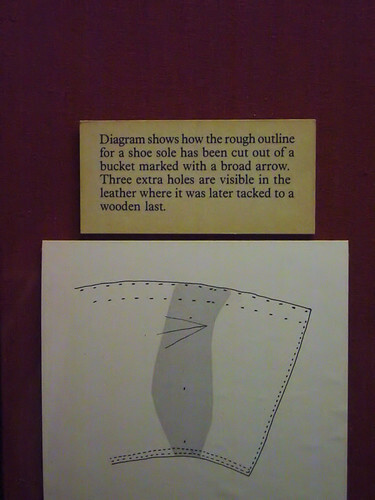 While this is a reproduction, the details are fundamentally correct. 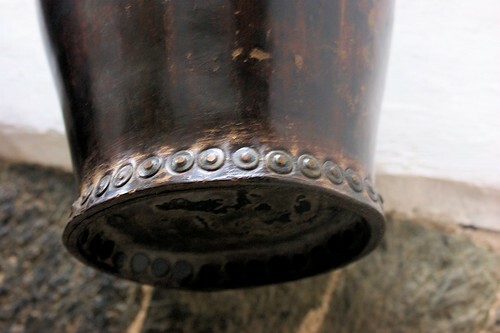 Note the spacing of the rivets and the arrangement of the washers. Seen that curve somewhere before? 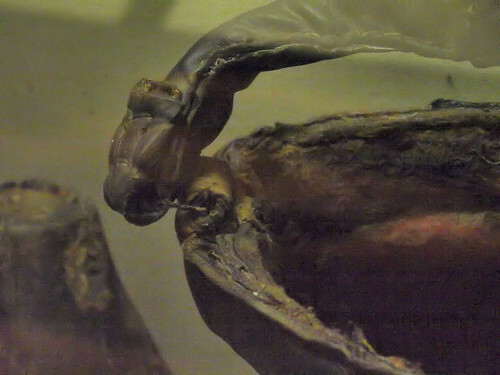 Here’s another shot of a reproduction from underneath. 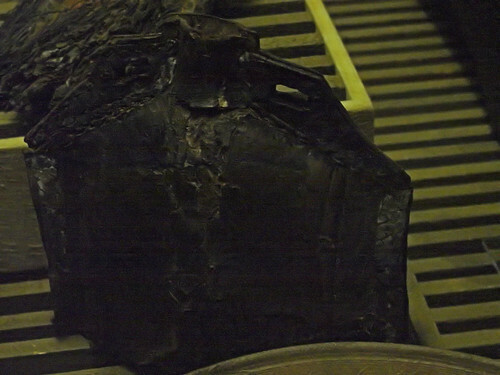 Looking up at one of the Victory's leather buckets. 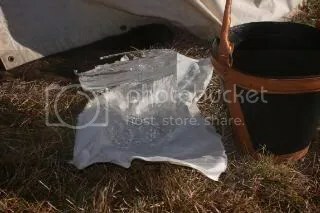 The sides of the bucket are considerable thinner than the thickness of the base, but it still illustrates my point. 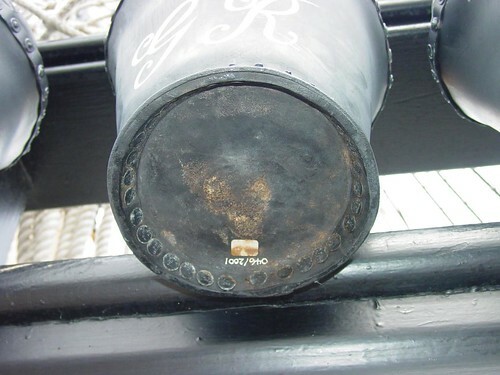 If you were to break off the bit with the four rivets to the left of the painted numbers, the piece would be about 25mm high to the crease in the base, about 65mm long and about 8mm thick. 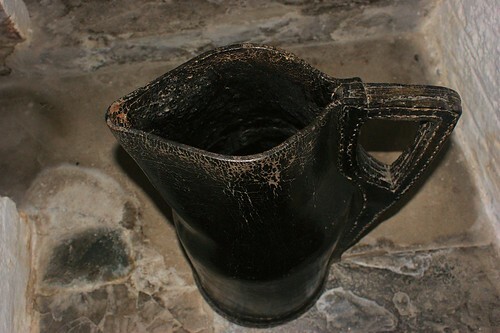 The oldest riveted leather bucket I’ve seen is one dated either 1660 or 1666 in the Museum of London. It is very different in form to the Victory’s, although there are a number the same shape and construction as the Victory’s and dating to the turn of the nineteenth century in antique shops around the world. 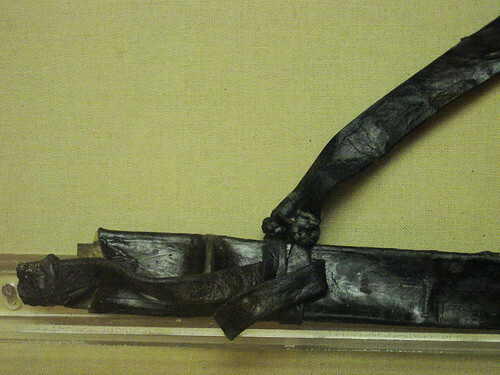 I really think the Portable Antiquities Scheme are looking at a later intrusion with this object. 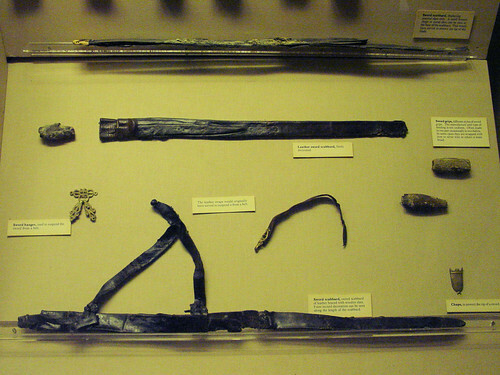 The identification from a photograph possible means the context or stratigraphy were absent when the identification was done and too much emphasis may have been placed on it being from a mid-seventeenth century battlefield site. 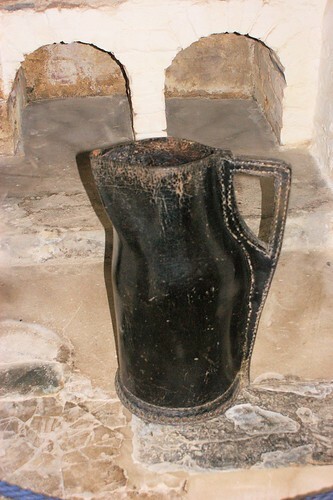 The find was found using a metal detector, meaning reasonably shallow and from ploughed land, leaving plenty of opportunity for later period objects to be mixed in with earlier objects. This is a post I wrote for another blog a short time ago. 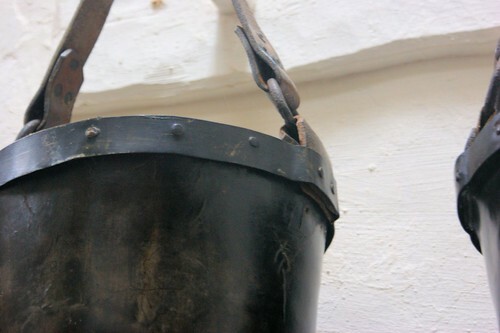 While discussing a particular set of wooden tubs that I’ve been repairing and maintaining for some time, it gives a comparison between the performance of wooden and leather buckets over a 12 month period in the situation that leather buckets were most commonly used in – being left dry for extended periods of time and then needing to hold water immediately. 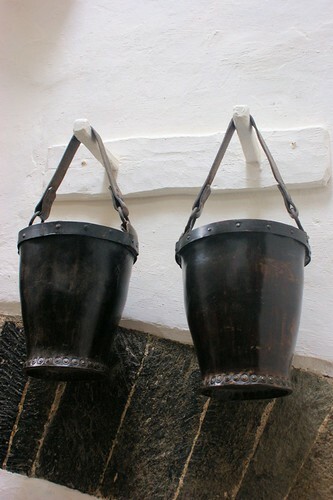 Obviously the findings aren’t valid for other locations and patterns of use where the buckets would be kept wet or used on a daily basis. 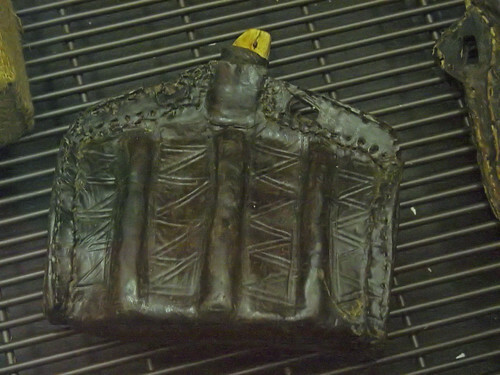 The testing was informal rather than structured but I found it interesting to note how the leather bucket performed in a variety of climactic conditions and rough handling, including freezing, 40 degree heat, humidity ranges from 4% to 100% (sometimes on consecutive days) and being dropped from a height of about 1 metre on to concrete. 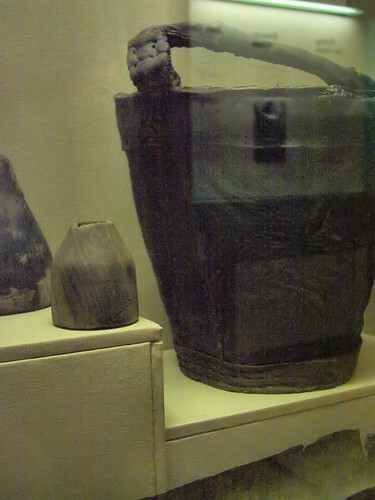 The wooden buckets were exposed to similar conditions and handling. I thought it might be of interest to readers here.